There is a great “ah ha” moment in the book, The Phoenix Project, when the hero, Bill Palmer, realizes why it takes his star IT technician, Brent, several days to accomplish a task that Brent said would take him 45 minutes! The reason it’s taking Brent days to accomplish the 45 minute task is that the task depends on several hand offs between different people and each hand off is eating a surprising amount of time. Why if each of the multiple steps only takes a few minutes each does the completed task end up taking several days? The reason is the queuing time between each handoff. Handoff time delays and handoffs delay inordinately the busier each resource is. Here is a chart from the book The Phoenix Project, in Chapter 23, that I like, because it makes the concept easy to understand, even if the chart is less than rigorous. 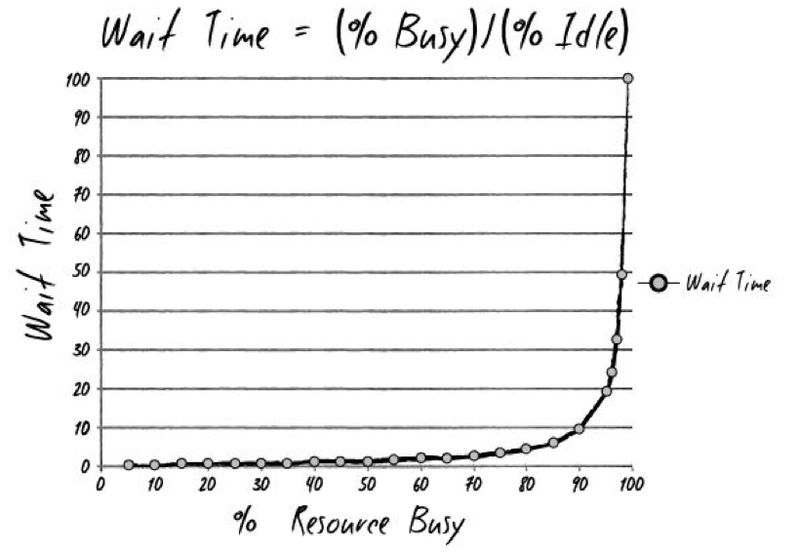 The chart shows that as a resource becomes busier the amount of time it takes to process the task grows exponentially. Say for example, the time it takes to process a task is 1 hour when the resources is 50% busy then the time it takes to process at 90% busy will be 9x longer or 9 hours. The formula is more representative of queue size than wait time but the idea is roughly the same. There is a detailed discussion of this formula on linkedin. A one of the characters in the Phoenix Project puts it “We’re losing days at each handoff” !! That’s why handoff delays are so impactful and if the task can be made self service these impactful delays can be eliminated. Now take a task such as creating a clone copy of a database. There are many steps and handoffs between teams. Of course if the database is large it takes a long time to just to do the copy of a database, but if the database copy is done with thin cloning like Netapp flex clone, how long does it take? Many of our customers are Netapp customers and previously used or tried to use Netapp to create thin clones. Electronic Arts used Netapp flexclone to create database copies. I asked them how long did it take to create a copy and they said 2-4 days! I was like “why? !” and they said because they had to enter work tickets. The work ticket went to the DBA who had to submit one to the Sys Admin who had to submit one to the storage admin and that they lost time in the hand offs. He said if everyone was in the same room maybe he could get a copy in 4 hours. Four hours is still vastly different than 4 clicks of mouse by a developer and a few minutes in the Delphix interface. A guy from Ariba told me the use flexclone on Netapp as well and that it took them 3 months because of the bureaucracy and passing off each step from team to team!